With energy bills yet again set to reach eye-watering heights, there are a few things you can do: obsessively compare tariffs, impose a strict lights-out policy on your loved ones, or maybe move off grid to a cabin in the woods. All have their appeal, but when it comes to saving money on energy, as well as to reducing your carbon footprint, it’s the little things that can make a really big difference — like solar-powered garden lights, for instance. With a whole range of fun and elegant designs to choose from, a few of these clever lamps can completely transform the look of your garden, patio, or even balcony, as well as extending its use. Plus, by harnessing a renewable energy source instead of standard electric, you’re not just saving money, but the planet. Go you! Many lights feature an auto on and off function whereby, once you’ve flicked the switch, they’ll happily charge during the daytime, turn themselves on at dusk, and then turn themselves off again at dawn, so you only have to set them once. A common feature, too, is the choice of wall-mounting and staking, for maximum versatility to suit your outdoor space’s specific needs. If you’re after a solar light for purely utilitarian purposes, look for an ultra-bright, ultra-durable model with a motion sensor, which is good for keeping your property safe and secure, getting garden jobs done in the dark, and for helping you find your way through the door after-hours. To make a feature of standout trees and plants, or otherwise provide a constant, focused light, a spotlight is your best bet. For atmosphere, there are faux torches, path lights and solar fairy lights to create a magical grotto feel in your garden, and even amphibious lights to light up pools and ponds. Start prepping your garden for outdoor living with our round-up of the best chimineas to keep the chill at bay during BBQ's and lazy outdoor evenings. Use these lovely solar string lights as low-key Christmas lights, or all year round. They look especially beautiful draped around a tree or pergola, but of course it’s up to you — the 32-metre light string gives you plenty of scope to exercise your imagination. For the price, it might seem galling that the integrated LEDs aren’t replaceable, but with a 22,000-hour lifespan and John Lewis’ lengthy warranty, they’ve still got the edge over cheaper competitors. These atmospheric tiki torches give your garden a Pacific vibe without even having to venture past the ring road, let alone to Hawaii. 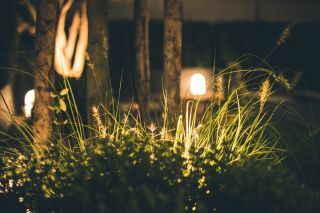 The beautiful flickering flame effect from warm white LEDs sets the mood perfectly for garden parties, or just chilling outside, and they’re well sealed against the elements for longevity. Cleverly, they have their own discreet solar panel contained in the top of the lamp, so no bulky extra bits to find a place for. For a path light that packs a few more lumens, go for the all-business Bailun spotlight, below. A beauty it ain’t, but this Mpow security light makes up for it in sheer brawn. With its own integral panels, it doesn’t require any extraneous bits of kit to charge its 54 ultra-bright LEDs, ready to dazzle any potential wrongdoers, or help you find your way back in after taking out the bins. It has a wide-angle sensor to pick up on movement 10 to 26 feet away, and a wide-reaching beam to light up any porch, driveway, or patio. For the peace of mind and ease of navigation it offers, the Mpow is our pick for best outdoor security light. The stainless steel construction and slimline design of these solar disc lights means they’re both durable and delicate-looking, a great combo in our book. Great for dotting along parameters either for safety, to avoid little ones (or clumsier big ones) tripping in the dark, or just for the great effect it gives. Unlike many other deck lights, they’re not connected by wires, so there’s no restrictions to where you put them. For decks and patios, these are the best — if you like the simple round design but would appreciate a stake option, try the Keynice lights below. These waterproof garden lights offer two ways to install: fix them to the wall, or stake them in the ground, and you’re good to go, no wiring necessary. The coolest thing about them is their amphibious design, and you can stake them in a pond or fix them to pool walls for instant atmosphere. The only problem is that there’s no option for white light, so if you’re after a neutral deck or wall light, try our Philips or Festive Lights picks. For great value pool lights or pond lights though, look no further. Bright and focused with a great choice of colours. Spot on. This quick-charging water-resistant offering from Bailun has our vote for best outdoor spotlight. The upgraded design now packs a focused beam of 200 lumens in a choice of white, red, green or blue, the 90 degree adjustable head means you can point it wherever it’s needed most, and, like many of the solar lamps on our list, it comes with stake or wall-mount options. If you want a bright, effective outdoor lamp, but don’t need a motion sensor, consider this as a demure alternative to the Mpow security light. Need garden inspiration ideas? Head over to RealHomes.com for garden inspiration.